This little oddball spotted at the 2006 Paris Motor Show is the Tang Hua Xiao Ya, looking quite sesat in the middle of all the other displays. It’s booth doesn’t even have any banners of any form, only a little oriental-style umbrella next to it, and a small dalmation toy in the car. 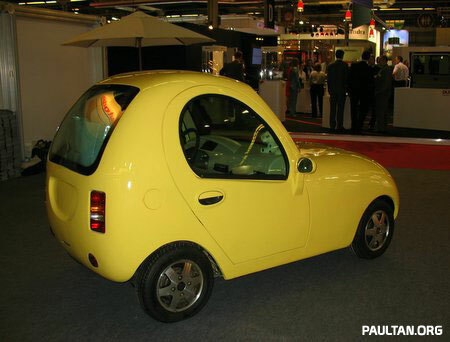 The little Tang Hua Xiao Ya is actually an electric car made in China, and features a 7 hour charge time, a 45 km/h top speed in normal mode which can be boosted to 64km/h in performance mode. It’s cheap though, at around US$5,000. 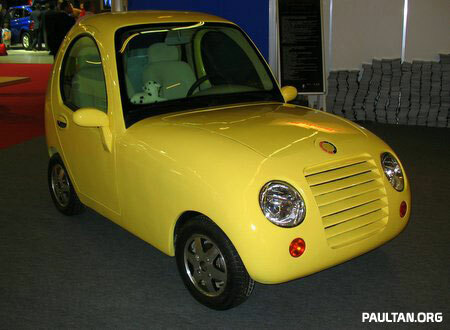 This must be what the old woman who lives in a shoe drives – a yellow shoe-mobile. One more photo after the jump.